The Toyota Auris is practical, comfortable and well built, which makes it one of the more frequently requested vehicles by our customers. It has a roomy cabin, with space for five and a surprisingly spacious cargo area as well. The Toyota Auris gets great mileage and is a fuel- efficient vehicle which is important to many drivers these days. With seating for 5 and the standard 5 door layout you can easily enjoy all the amazing features while staying comfortable from the beginning of your trip to the very end. 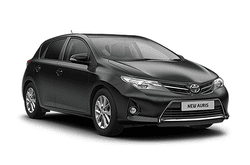 To see for yourself what all the fuss is about and why the Toyota Auris rental is so popular, check it today and make your reservation with us now. You will be glad that you did!